The debate over global warming is now entering the classroom and its proponents are alarmed. It seems the “dogma” of the existence of global warming is running into problems as boards of education in several states have established a standard that requires the presentation of climate change “denial” as a valid scientific position. Legislators in other states have introduced bills that require equal time for climate change skeptics’ views in the classroom. With new national science standards from kindergarten through twelfth grade due by the end of 2012, we can expect to see a heated debate over climate change appear more often in court and in the classroom. The National Center for Science Education’s [NCSE] is challenging such restrictions. It seems anyone who so much as questions the reality of man-made climate change is in a psychological state of “denial” of established science. The Center’s education initiative 1 seeks to impose the climate change agenda upon our school children leaving no room for scientific method or debate. In the opinion of the NCSE, “there is virtually unanimous scientific agreement about climate change.” What is this claim founded upon and who are the renowned scientists that signed on to this statement? It seems NCSE has simply dismissed all those who disagree with climate change theory. Note that no figure of the percentage of scientists in agreement is given, perhaps because they deem the number to be so insignificant. A simple exaggerated statement suffices to provide all the emotional arguments to justify their agenda. An excellent article in the Wall Street Journal, titled “No Need to Panic About Global Warming” claims “there’s no compelling scientific argument for drastic action to ‘decarbonize’ the world’s economy.”2 It clearly states, that in fact a growing number of distinguished scientists and engineers do not agree that drastic actions on global warming are required and that CO2 is not only, not a pollutant, but it is a key component of our biosphere’s life cycle. Happily, the climate change program is finding a substantial amount of resistance among students across the country as well. 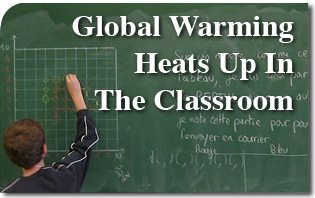 A poll conducted last November by the National Science Teachers Association [NSTA],3 found that 82 percent of students surveyed demonstrated skepticism regarding climate change and 26 percent of teachers’ administrators showed the same tendency. Nevertheless, climate change advocates in education keep repeating the same old slogans. With a persistence almost worthy of admiration, one might conclude that some of these educators are following the advice of Robespierre: The secret of freedom lies in educating people, whereas the secret of tyranny is in keeping them ignorant. This entry was posted in News Commentary and tagged agenda, biosphere, Classroom, climate, climate change, CO2, debate, freedom, global, heat, life, method, National, National Center for Science Education, NCSE, news commentary, NSTA, panic, pollutant, Robespierre, science, scientific, scientist, secret, slogan, Student, teachers, theory, tyranny, Wall Street Journal, warming by Gary Isbell. Bookmark the permalink.